The Scanning Flow Cytometer (SFC) is the next generation of flow cytometry instruments because it provides measurement of extended fluorescent and light-scattering data. The most charged ordinary flow cytometer measures 2 signals from forward and side light scattering and up to 16 signals from spectrally windowed fluorescence. 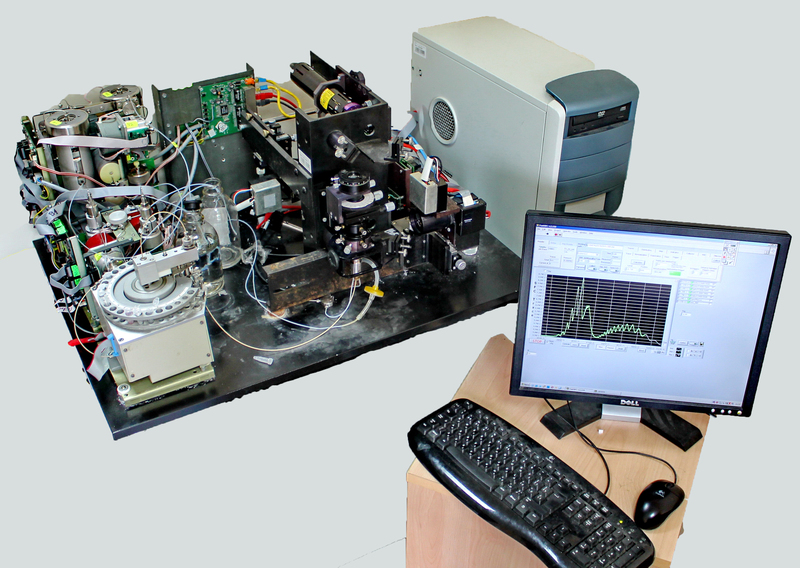 The SFC allows the measurement of entire regular and polarized light-scattering profiles and entire fluorescence spectrum from individual cells. The light-scattering profiles substantially expand the performance of flow cytometry in an analysis of individual cells. These profiles are utilized in the solution of the inverse light-scattering problem with original novel-developed mathematics and software including the super-computing ADDA code and meshed database. The morphological characteristics of cells are evaluated from this solution, whereas the ordinary flow cytometer just differentiates cells. The fluorescence spectrum increases a reliability of identification of cells which carry specific-linked dye molecules. The high reliability of identification obtained from the spectrum by multiparameter global optimization with the DIRECT algorithm allows one to increase a number of cell subtypes to be identified from flow cytometric analysis. The extended performance of the SFC was realized with the uniquely designed optical scanning cuvette. This cuvette integrates light scattered by a cell that opens a sub-micron world for flow cytometry with characterization of bacterial cells, blood microparticles and phospholipid vesicles. Mononuclear cells (stem cells, suspended culture cells, lymphocytes, monocytes) cell and it nucleus sizes, optical density of nucleus and cytoplasm, apoptotic volume depletion Characterization of lymphoproliferative disorders, diagnostics of apoptotic activity, detection of cancer, response to the transplantat. Stem cell characterization for therapeutic treatment. Blood microparticles concentration, size, optical density Marker of inflammation, cells activation, apoptosis, characterization of coagulation, Scott syndrome. Rod-like bacterial cells length and diameter, growth rate Microbiological express-analysis and antibiotic resistance diagnostics. Membrane receptors distribution of membrane receptors over all cell subtypes measured from entire fluorescence spectrum Estimation of the functional activity of the immune cells. There is the new table with blood cell characteristics (January 2017) as a PDF file . The basic principle of the SFC technology was patented in USA (United States Patent 5,650,847 Jul 22, 1997). The blood cell analysis with the SFC was patented in Russia (RU patent N 2347224, 10 Jan 2007). There are over 40 original publications with development of the SFC and it applications. The ten PhD theses dealing with development of the SFC technology were defended by the students in Novosibirsk State University (Russia), in Amsterdam University (Netherlands), in Institute of Biophysics (Czech Republic), in the State Centre for Virology and Biotechnology (Russia), etc.